Accumulated Precipitation 1/1/2014 - 4/16/2014. Maximum accumulation in blue, this year to date in green, normal curve is brown, minimum is red. Top row: Baker, Diablo, Ross Dams. Bottom Row: NewHalem, Arlington, Concrete. From NOAA Now Data . Click picture to Enlarge. No doubt it has been a wetter than normal year in the Northern Cascades. The R Code for this exercise is far below. Inspired by a Dan McShane post, I looked at an Atlas 2 (NOAA) GIS data set covering Precipitation Frequency in WA State from 1897 - 1970. I am going to have to dig a little deeper at http://www.climate.gov/datasearch/ to get the later data. The pacific northwest region does not have updated data for precipitation frequency in this particular format yet. NOAA admits that such updated reports for select regions are overdue. 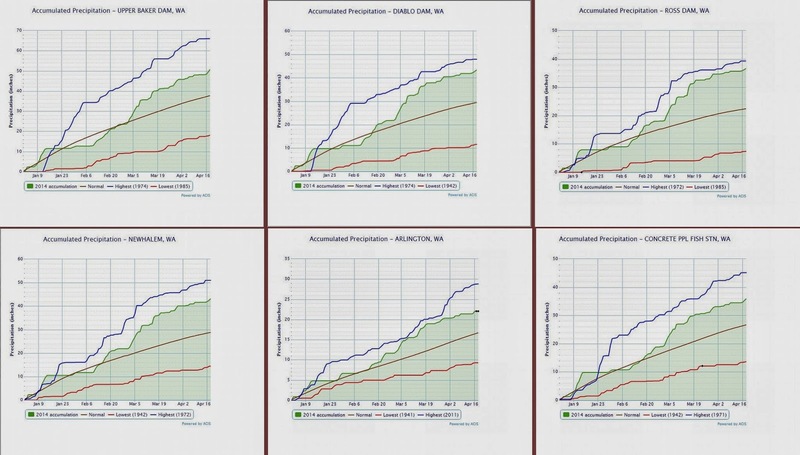 Western WA receives tremendous amounts of rainfall in comparison to other areas of the country. Most of us who have lived here more than ten years have surmised that the rainy season seems to be increasing in length with more 'warm' rain coming from the South ("Chinooks"). Here in Whatcom County, plenty of hard, cold rain still comes from the North as well. 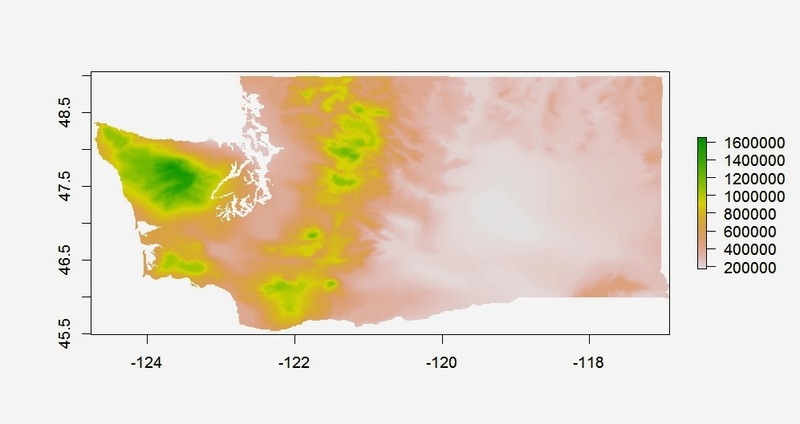 The first chart below shows the drenching the Olympic Peninsula and Olympic mountains receive. You will notice the distinctive "rain shadow" that appears north and east of the Olympics. Don't let this fool you. You can get caught in a serious rain storm driving though Sequim or Port Angeles or any of the small cities on the Pennisula long before you decide to spend the day hiking Hurricane Hill in the Olympics. All of western Washington and especially the Cascades receive substantial amounts of moisture. In Whatcom County, Mt. Baker holds some of the last of the glaciated mountains in the contiguous 48 states. Sometimes Artist Point is not cleared of snow until July 4th. Here in Western, WA., we don't waste our brief but beautiful two months of summer, nor any sunny days that flirt in between storms before then. But we are not afraid of the rain,wind, or snow either. 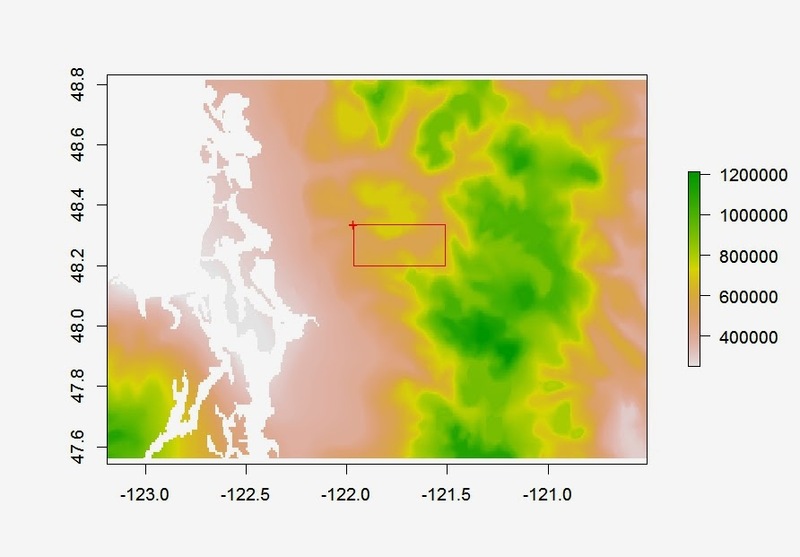 The two charts below show that the area of the Hazel mudslide appears to (historically) have existed at the bottom of a "wet pocket". The approximate location for the Hazel headscarp is 48.2848171, -121.8494478 . (For a picture of the headscarp, please see this outstanding March 26th photograph from Earth Fix!) . The slopes above Hazel, appear to have been a particularly rainy. Indeed, it almost appears as if Hazel herself seems to have been the southern gate keeper of this rainy pocket. This data has been developed in conjunction with some statistical modeling; but we can take it at face value for now. A screenshot from google maps below shows the rugged, well forested (and well logged) area between the Skagit and Stillaguamish rivers. The Hazel landslide area is in red. Now might be a really good time for NOAA to make available precipitation frequency in this format from 1970 onward for Washington state. 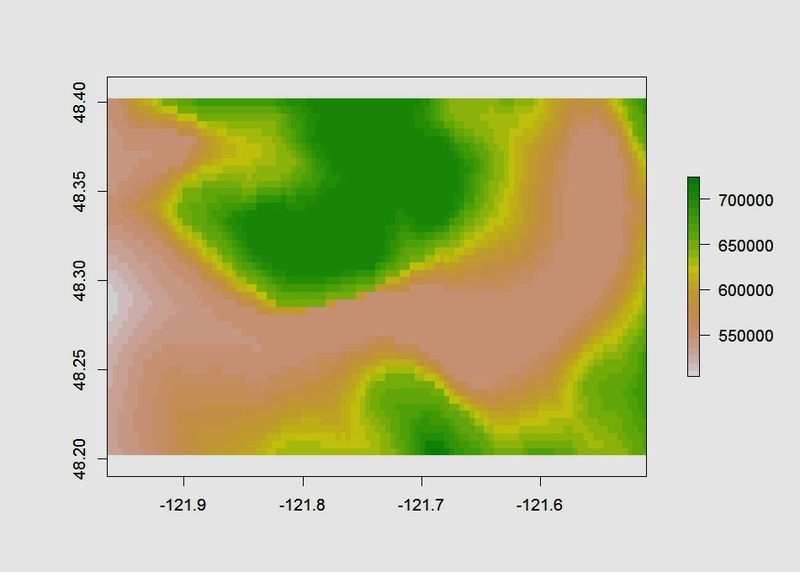 Hydrology is an important factor in understanding and predicting mudslides.